Nothing makes you slump, sigh or roll your eyes more than the realisation that it’s time to lug that full basket of dirty clothes into the most boring space in the house. But why is it the most boring space in the house? Does it need to be ‘the space style forgot’? Here at Designbx we’ve decided to think about the humble laundry more laterally. Given the time we spend in that small room, shouldn’t we be making it as visually pleasing and functional as possible? Maybe all this time we’ve been torturing ourselves unnecessarily. Is it possible to actually want to spend time in the laundry? This was a challenge we had to accept! Firstly, laundry fittings, plumbing and appliances have come a long way. 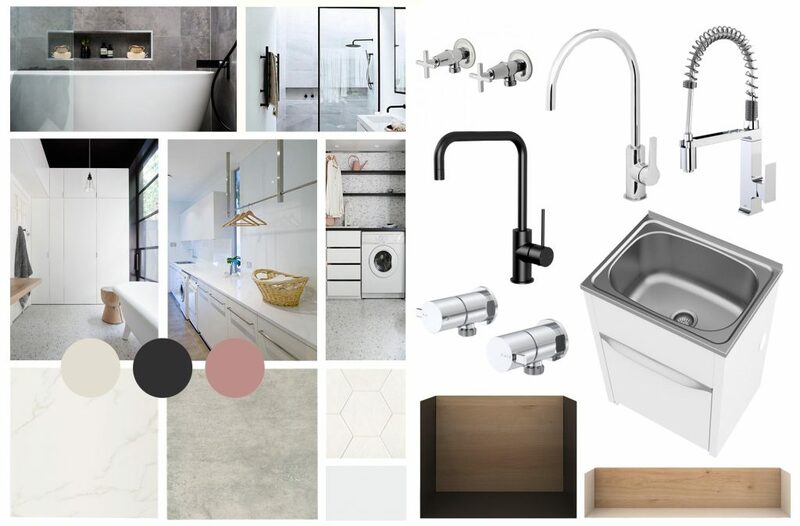 Pull-down mixer taps, deep laundry sink bowls, mould-resistant wall finishes, and custom storage solutions are a few of the modern laundry items that are becoming the norm rather than the exceptions. Combine them with a fresh take on aesthetics, and suddenly you’ve got some unexpected bling that might make chores a little less challenging. Rather than distracting the eye from equipment, it’s the more functional items in this striking design that provide the pop and dazzle. The quality of curved chrome tapware, especially the pull-down tap, draw the eye and make a real impression while adding convenience. Custom cabinetry provides concealed storage, and the monochromatic colour scheme becomes a canvas where you can add your own bling courtesy of a floating shelf dressed with ornaments or plants. Everyone’s mad about Scandi this year and the interior design style’s love of minimalism is perfect for the laundry. 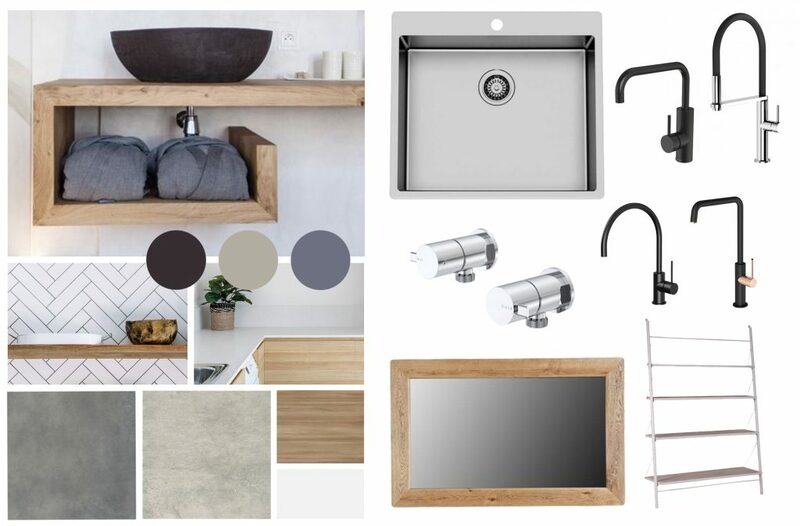 The brushed rose tapware contrasts beautifully with matte black and chrome while the oak timber mirror, floating shelves and tough bench tops deliver the raw finishes that are a trademark element of the Scandi look. Last but not least, how about those geometric splashback tiles? Stone, timber and ceramic finishes, brought to life by a natural palette – that’s why we love Scandi. You may not associate a laundry with elegance but this design is about to change your opinion. In fact, this space is about to become a real show-off and start demanding attention. Classic European décor and well-detailed pops of luxe combine to add an air of refinement. 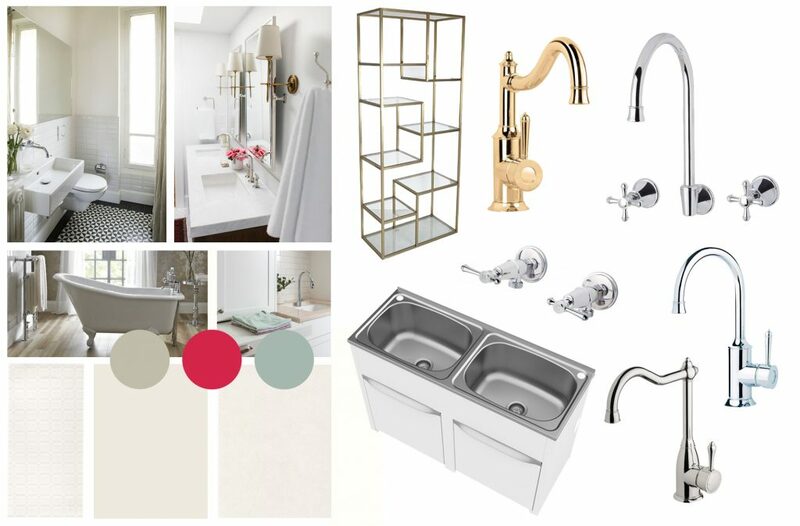 The sophisticated tapware goes beyond function to become a chic feature. Brushed rose, the patterned floor tiles and curved tapware become the focus. But it’s hard not to fall in love with that free-standing bath. Using the three styles above, it’s possible to take a room that begs you to close the door, and make it a dazzling space that you’ll gladly include in the tour when friends visit. From ugly duckling to beautiful swan, it’s time to stop hiding the laundry and give it the same design love applied to the rest of your home. Visit Shop the Look for more ideas on pre-fabulous interior designs!